World’s biggest boy band, Bangtan Boys a.k.a BTS were the latest guests at ‘The Tonight Show’ hosted by Jimmy Fallon. On the show,the boy band’s members shared what had they been up to recently and what are their future plans. 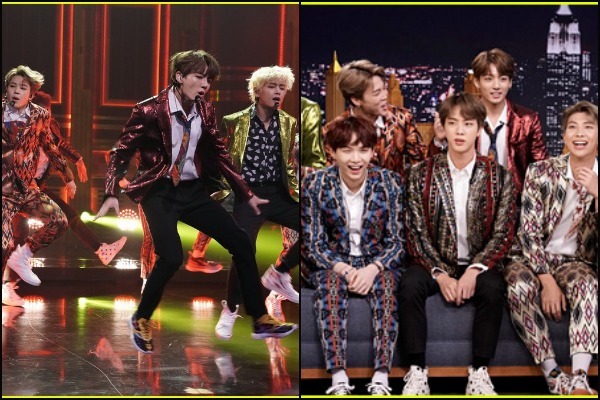 However, the BTS boys— RM, Jim, Suga, J-Hope, V, Jimin and Jungkook shook the audiences when the K-Pop band members sang their latest song and showed their killer dances moves in a dance challenge along with host Jimmy Fallon! First, BTS and Jimmy Fallon took on the Fortnite dance challenge where they all had to imitate the dance moves of characters in the game ‘Fortnite’. As expected BTS members—RM, Jim, Suga, J-Hope, V, Jimin and Jungkook crushed the challenge with their smooth dance moves! Clearly, all the rigorous dance training has paid off! Coming second close to the BTS members, Jimmy Fallon too, dropped some amazing dance moves. Towards the end of the sketch, BTS taught host Jimmy their ‘Idol dance’. After learning the steps successfully Jimmy gleefully stated that he is the part of the band! Later the members of the K-Pop boy band joined Jimmy Fallon at the studio. The band introduced themselves to the audiences and shared their of winning Grammy. RM introduced himself as leader of band and english translator for the band too. Talking about his historic speech, RM said that he was so nervous that he was shaking! As a conclusion BTS put up a show-stopping performance of their latest track ‘IDOL’ as well as a bonus performance of their track ‘I’m Fine’. Next : Judwaa Actress Rambha Welcomes Her Third Child— A Baby Boy!